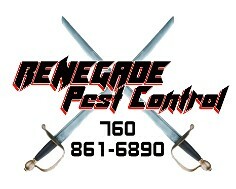 Proudly serving the Coachella Valley, Renegade Pest Control gets rids of unwanted pests in your home or business. We can take care of any pest problems that may arise and our customer satisfaction is always guaranteed. Renegade Pest Control is a licensed, bonded and insured pest control company with over 25 years of experience in the Coachella Valley. From Palm Springs to Rancho Mirage and Palm Desert to Indio we provide quality on time service and Bill, our owner is always available because we care about you and the service we provide. We offer free estimates and competitive pricing. Contact Renegade Pest Control to request an estimate on our range of services for your home or business.